OVERVIEW: The X-Men are back for more nonstop thrills and excitement in Volume 3 of the definitive animated series. Faithfully created from the pages of the original Marvel® comic books, these classic stories are a must-have for any X-Men fan! When the all-powerful Dark Phoenix inhabits the body of Jean Grey, The X-Men go to battle in order to save one of their own. Get into the action with 15 spine-tingling episodes, including the 4-part "Dark Phoenix" saga, in this collectible 2-disc set! REVIEW: Relived and enjoy the adventures that make you woke up early every Saturday morning. Or at least for me there was not a better way to begin the weekend than with a fresh episode from the X-men Series. In X-Men Volume III we continue witnessing the struggle between good and evil, Love and Hate, and acceptance and discrimination, well now that I am old enough to admire all those things from a Saturday morning cartoon, but mostly what I enjoy most about this series is the quality of its stories, each episode of the X-Men series is just full of action, imaginative characters, out of this world situations, X-Men the animated series is just about 345 minutes of good time without commercials. Like in the previous volumes the excitement continues in this one, it will grab you from beginning to end. What I enjoyed about this volume is that is all about Origins,. Well not really, but we really get to know a lot about the characters, most of the episodes tells us something important about one of the main characters We get to know about Storm, Cyclops, Xavier, Nightcrawler, Juggernaut and of course Wolverine. It presented this without contradicting itself, The Story line and time is wonderfully worked in this series it takes references from previous episodes, and if it has to added something it does it with such delicate that it does not affect what it has been previously seen keeping itself loyal to the series and the comic books. The third volume has fewer episodes than the previous ones, the first Disk opens with two episodes that are somehow irrelevant to the story, but after that it takes full speed with one of the most entertaining sagas in X-men Mythology, The Dark Phoenix Saga. The Second Disk on the other hand is more independent each episode is set by itself describing a different set adventures, with the X-Men and the audience finding exciting and sometimes funny stuff about their past, future or Alternate future. Technically speaking like in the previous volume there is not much mastering, the episodes look just like what it is a 18 year old cartoon, the action, colors and sound are the same as I remember. Of course if we compare it with modern cartoon we could be disappointed it however this series makes it up with content. 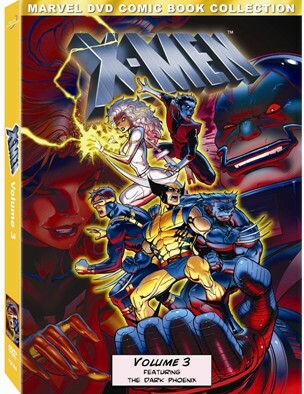 As with the previous two sets I recommend this DVD to all the X-Men fans, this is a most have. For younger X-Men fans who did not have the joy to see it when it first aired, I recommend to watch it with out comparing it to the modern fast pace, graphical animation, and I am sure you would have fun . SPECIAL FEATURES: WAs The previous volume, this DVD collection do not have any special features but some sneak peeks of upcoming Disney movies. However I have to say that this do not change my perspective on the DVD , since its value is more in the series than the features. The DVD looks however is great the cover is very colorful and persuasive and the menu is easy to navigate. One complain is that it has like eight minutes previews before it gets to the main menu.